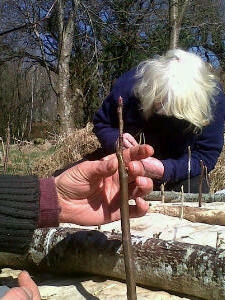 The sun was shining for our Apple Tree Grafting Workshop today and by the afternoon it was even fairly warm! 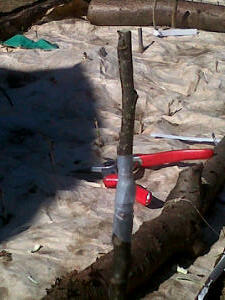 Six people came to learn to graft apple trees, using the whip and tounge method. After some theory in the morning and a practice session on some twigs, everyone went out to the allotment to have a go at the real thing. We were surprised at the popularity of this course, which booked up very quickly. We are running a second workshop at Clynfyw on 17th April, on which we have one place left, contact us if you are interested. 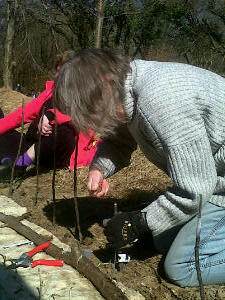 We will also run the workshop at the Trust again in 2014. 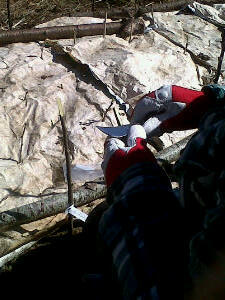 This entry was posted in Courses and tagged apple, course, grafting. Bookmark the permalink.